Early this morning US time, two 500-pound, laser-guided bombs were dropped by US forces on Islamic State (IS) targets outside of Erbil, Iraq. Overnight, the Obama administration shifted its policy of non-military intervention in the ever-expanding conflict with the Islamic State, citing both humanitarian and strategic concerns. Since June 2014, Islamic State has made several alarming advances in Iraq and Syria, claiming major cities such as Fallujah, Ramadi, and Mosul, and re-engaging Syrian government and rebel forces across the border. Islamic State positions. Courtesy NY Times. The capture of key territory in both countries has reinforced the extremist group’s financial and military resources, and in IS strongholds, a strict form of Islamic law is being enforced. The US airstrikes come on the heels of the displacement of tens of thousands of Yazidi Iraqis, whose religion has been deemed “devil worship” by IS and who were warned to “convert or die.” In his statement last night, US Pres. Barack Obama indicated that the decision to expand humanitarian and military aid was based on fears that “acts of genocide” may soon be carried out against Iraqi Yazidis, approximately 40,000 of whom are trapped without food or water on Sinjar Mountain in Kurdish Iraq. The Kurdish Regional Government’s security forces, the Peshmerga, have lost several significant battles with IS in recent weeks, undermining a widespread belief in their ability to maintain control of Iraqi Kurdistan. Islamic State’s incursion into Kurdistan is the latest strategic move in its long game to control enough territory to create a fundamentalist caliphate in Iraq and Syria. In January 2014, after being forced from Aleppo, Syria by other rebel groups, IS turned its strategy east, capturing key arteries of money and supplies to help it rebuild. Meanwhile, the Asad government focused its military efforts on Western Syria while allowing IS to continue fighting with and weakening other rebel groups. As IS regrouped in northern and eastern Syria, it launched a new offensive in mid-2014 in both Syria and Iraq. In April 2014, IS forces captured the Fallujah dam and, by opening its reservoir, flooded crops as far as 100 miles away. Since June, the group has consolidated its control of both the Qaim and Abu Kamal border crossings with Syria, allowing for easy transfer of supplies, arms, and fighters between the two countries. The Iraqi government’s discriminatory policies towards Sunni regions in Western Iraq, notably in Anbar province, fomented local anger with the central government and created an opening for IS forces to move in on key cities. The brutal repression of a Sunni protest camp in Ramadi in December 2013 by government forces radicalized many local Iraqis against the government and led to their support, or at least tolerance, of IS forces in their ongoing battle with the Iraqi Security Forces. In a humiliating defeat for the Iraqi government, Islamic State captured key northern and eastern cities Mosul and Tikrit in June. In Tikrit, the group claimed to have executed 1,700 officers of the security forces, and Human Rights Watch confirms about 190 men were killed between June 11 to 14. Meanwhile, in Syria, IS moved westward once again, capturing not only territory, but also military supplies from fleeing rebel and government forces, positioning itself to retake the territory it gave up earlier this year. The fight has also reached neighboring Lebanon, where IS forces fought Lebanese security forces last week for control of Arsal on the Syrian border. 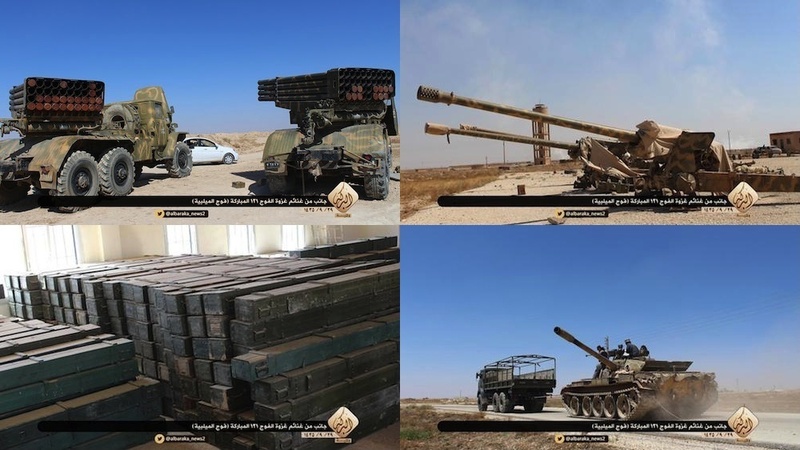 Military supplies captured by IS from Syrian Arab Army. The Islamic State’s strategy of capturing both military and financial resources is paying off, and will complicate any effort to stymy the militant group’s regional ambitions. Its control of both oil and natural gas fields has allowed it to be less dependent on foreign funding for growth and operations. Experts estimate that the group could be making up to $3 million per day from the black market sale of crude oil. The Islamic State is also still battling to control the Baiji refinery in northern Iraq, which would give it the ability not only to process crude oil, but also to deprive the central government of revenue from the 33 percent of Iraqi oil refined in the facility. Yet oil and gas alone are not the most important resources in the Middle East, despite Western interests in their security. 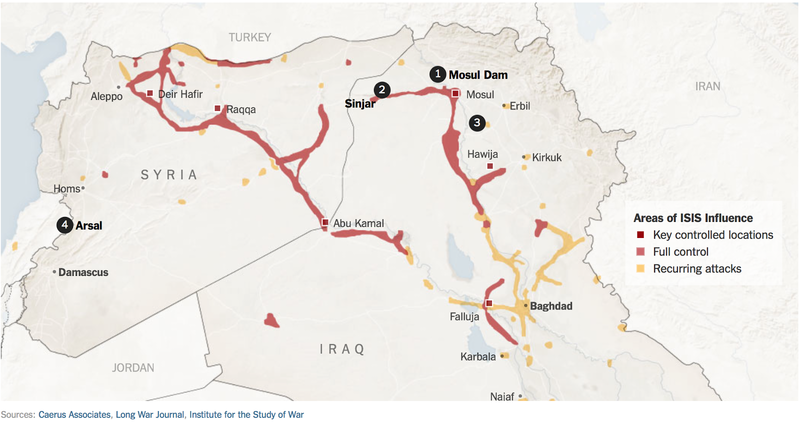 Water resources have been a key target of IS attacks, and their military advances have largely followed Iraq’s two major waterways, the Tigris and Euphrates rivers. Since Sunday, conflicting reports have surfaced that IS has taken the Mosul Dam, Iraq’s largest, and today have been confirmed by many news sources. Dams provide control of both a region’s water and electricity, and the decision to either stop the flow of water or to release it entirely can be equally devastating in Iraq’s climate. The Mosul Dam, in particular, is an incredibly dangerous site for IS to control: its reservoir could be released either intentionally or unintentionally. Built on unsafe porous foundations, the dam requires constant pumping with tons of grout, an effort kept up by multiple Iraqi governments for the past 30 years. If IS does not preserve the current level of grout reinforcement, the dam could burst accidentally, flooding hundreds of miles of farmland and killing up to half a million civilians in the process. The dam’s structural weakness was a key concern of US policymakers during the Iraq War, and a burst would release millions of cubic meters of water in a wave up to 20 meters high, leaving a flood of 10 meters of water in its wake, including in the streets of Baghdad. Air strikes may be effective in holding of IS troops from Erbil, the capital of Kurdistan, but they cannot assist the Iraqi government in the long-term effort to weaken and destroy the Islamic State. As former USAF Colonel Cedric Leighton, speaking on CNN this morning, pointed out, “there is no way to combat an ideology solely from the air.” The Islamic State’s strength rests in the fact that its enemies are divided, and that it now controls the resources it needs to expand its military activities. To address the former, the US can only work to bring the various ethnic, regional, and tribal factions of Iraq to the negotiating table to work out a political settlement to the current crisis. Prime Minister Nouri al-Maliki has lost the faith of all parties save his own Shi’ite backers, and cannot be a viable political leader in such a climate. A roadmap to transition that includes early elections and power-sharing agreements, coupled with concrete goalposts to demonstrate political achievements to the civilian population, will be essential to breaking IS’s appeal to some segments of the population. The US can wield its military and diplomatic power as widely as possible to cajole, coerce, and convince disparate factions to come to the negotiating table, but the Iraqis themselves must complete the real work of negotiating a solution. The US also must include regional partners, such as the Iraqi Security Forces in southern Iraq and Kurdish Peshmerga in the north, to carry out operations that require boots on the ground. Air strikes are most effective where the target is contained, easily identifiable, accessible, and isolated from both civilian populations and key resources. In the case of important cities held by IS such as Mosul, and key infrastructure such as the Mosul dam, air strikes would fail to achieve positive gains for the Iraqi government and US forces. Bombs such as those dropped outside of Erbil would indiscriminately destroy not only IS forces, but also civilian populations and homes, and, in the case of the Mosul Dam, cause a possible burst that could lead to the catastrophic flooding described above. The US should instead focus on arming and training the local Iraqi ground forces from both the ISF and the Peshmerga to invade and retake territory and infrastructure to reverse IS advances and push the group back across the Syrian border. The two forces could “squeeze” IS from the north and the south, and force it back though the corridor to Syria from whence it came. In Syria, air strikes may be effective against supply routes and to set up areas of safe transit for civilians, but again ground troops will be necessary to retake IS territory and destroy the group’s operational base. Without undermining the Islamic State in Syria, Iraq will never be fully secure. Yet it will be no surprise if, as has been the case for the past three years, a palatable strategy to end the Syrian civil war cannot be found by regional and international partners; if that remains the case, then IS will maintain a strong position from which to unfurl future havoc on the region.